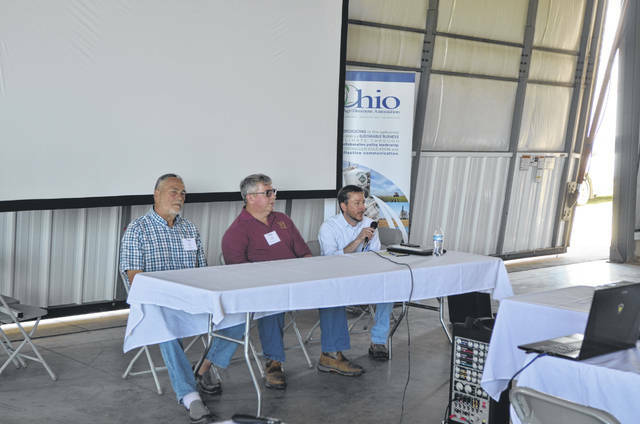 FOREST — In an effort to educate farmers about reduction of nutrients and sediment loss in the Ohio waterways, the Ohio Agribusiness Association and various other agriculture organizations held the 4R Technology Review Field Day Tuesday. One of the various conservation efforts is the Blanchard River Demonstration Farms, a five-year, $1 million project between the Ohio Farm Bureau Federation and United States Department of Agriculture Natural Resources Conservation Service. The project selects farmers and requires them to conduct public demonstrations on their farms for a duration of five years. The hope is to help producers find the right combination of practices to help reduce nutrient and sediment loss into Ohio waterways. The Stateler Family Farm in McComb is one of the three Blandchard River Demonstration Farms in Ohio. Duane and Anthony Stateler operate approximately 600 acres of land, which encompasses corn, soybean and wheat and a 7,200-head wean-to-finish swine operation. The Statelers have dedicated 243 acres to the Demonstration Farms project and have incorporated a new composite facility, a new wetland, and three new water gates to help reduce the amount of phosphorous that enters waterways. A second demonstration farm is Kurt Farms in Dunkirk. Chris Kurt operates 470 acres of corn and soybeans and has dedicated 168 acres to the Demonstration Farms. At his farm he has phosphorus removal beds, filter strips, edge-of-field monitoring, variable-rate fertilizer application, drainage water management and a new two-stage ditch. The third demonstration farm is the Kellogg Farms in Forest. Bill and Shane Kellogg operate 5,000 acres of corn and soybeans and have dedicated 305 acres to the project. The farm has cover crops, reduced tillage, abandoned water well removal, grassed waterway and a pollinator habitat to reduce sediment and nutrients into waterways.